The first film I ever watched by Eran Riklis was The Syrian Bride, starring Hiam Abbass and Makram Khoury. I remember how enthusiastic I was to finally learn something that wasn't commonplace about the Druze community in the Golan Heights, through the work of this wondrous filmmaker. Fast forward to years later when, at a party, upon meeting a Syrian Druze gentleman I exclaimed "OMG, you must watch The Syrian Bride, it's a gorgeous film about your community made by an Israeli director." The man looked at me in disbelief and answered "What does an Israeli know about the Druze!" It was then that I first realized how our origin, our background affects what we're allowed, and not allowed to talk about, even as artists. Thanks goodness Riklis never got that memo! From Cup Final to The Human Resources Manager, from Lemon Tree to Zaytoun, Riklis has always talked about the untalkable in his films: Peace, humanity, and the ability to discuss what makes us different, while also celebrating our contrasts. I'm a year late in watching Riklis' latest, A Borrowed Identity -- also known as Dancing Arabs, the film's original title at festivals around the world, and Mon Fils, "My Son" in its French incarnation. But better late than never in this case, because once again, I walk away from one of Eran's films a different woman, a more informed person and a better human being. It's become the norm for me with the work of the most open-minded, best cultural bridge-building filmmaker I know. Typically, I would have watched a film like A Borrowed Identity in Cannes or Venice. But the film ends with such a provocative scene, an idea so unthinkable and bold that I can only imagine the programmers at those festivals scrambling to find words to explain their choices to the press. Simpler for them to just turn it down, quietly. So while it premiered at Locarno, where it was also not given the Golden Leopard it deserved for the same reasons, I assume, A Borrowed Identity traveled a different festival route, finding its biggest success in open-minded Telluride. Now, it is finally in US theaters, enjoying a second week at Lincoln Plaza in NYC, rolling out to West Coast theaters this weekend, and later across the US. A Borrowed Identity opens with a line by Palestinian poet Mahmoud Darwish that goes "Identity is our legacy and not our inheritance; our invention and not our memory..." So why should where, how and who we are born decide what we can and cannot do? Unfortunately, not everyone in this world can make a choice, or even attempt to wonder aloud what I'm writing know. Palestinians and Israelis risk much when they do. Riklis' film begins slowly. But it builds momentum to a finish that left me and my viewing companion in sobs. I'll admit something that shames me, I might have left the theater in the first twenty minutes if I didn't possess the faith I have in this filmmaker's genius. The background about the family, the part that comes from the first of Sayed Kashua's books to make up the storyline of A Borrowed Identity -- Dancing Arabs -- didn't envelop me right away. Perhaps I would have liked only a hint of the grandmother, as a voiceover, with the fated suitcase opening upon her death and the instructions carried out by her nephew, Eyad (played by the most charismatic acting discovery of the year, Tawfeek Barhom). The story could have started there for me, I didn't need childhood scenes or interiors. Yet once Kashua's narrative from Second Person Singular kicked in, the film grabbed me wholeheartedly. There was no turning back, no turning away from that big screen even for a minute, only and completely with all my being following the triangle of Eyad, Yonathan (played to perfection by Michael Moshonov) and his mother Edna (played by one of my favorite actresses, the stunning Yaël Abecassis). What followed turned out to be, once again, one of those Eran Riklis masterpieces of endless possibilities. Israeli Arab novelist and journalist Sayed Kashua also wrote the screenplay for the film, which may explain the indulgence of the family set-up. To a writer's format such details are necessary, while in a film they can be done away with. 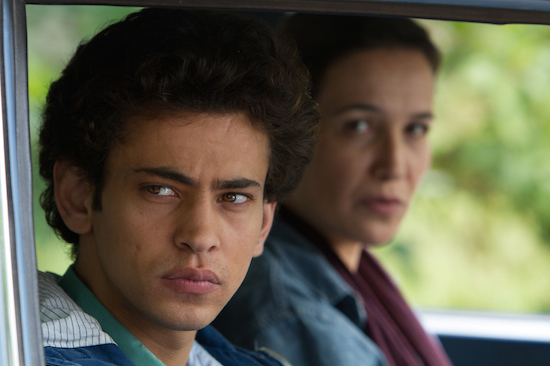 Though Eyad's father Salah's efforts (played by Ali Suliman), to send his son off to an Israeli Hebrew school, clarify much and probably couldn't be dealt with differently in the narrative. In the end, A Borrowed Identity left me with more questions than answers, more thoughts than words. That's what a great film should always do, while also helping its audience to understand themselves and the world around them just a little bit more. It's a film full of courage, by a filmmaker who is unafraid and unapologetic about who he is. And perfect proof that our background, our birth-given opportunities have very little to do with the person we become, despite what the world wants us to believe. For info and screenings check out the Strand Releasing website. Image by Eitan Riklis courtesy of Strand Releasing, used with permission.